This article is the natural continuation of “A plastic of world…“published some time ago. At that time we did a roundup of the most important “traditional” plastics commonly used in for containers and packaging. 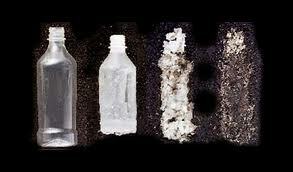 In this article we will look at the frontier of technology that deals with plastics. Under the growing pressure of the need to preserve the environment, but also to cope with an increase in the cost of raw materials, petroleum, from which traditional plastics derive, it’s developing at increasingly accelerated pace a range of alternative materials which are united by the name of bioplastics. The challenge of these new materials is to reproduce, and maybe even improve, the chemical and mechanical properties of common plastics, but contrary to petroleum, to be able to be attacked and decomposed by microorganisms present in the environment. This type of plastics do not accumulate in the environment for an indefinite time but belong to a cycle in which the plastic material falls to be part of the food chain. While the raw material to produce the plastic is known to be the petroleum, which is a non-renewable source, in fact being depleted, for the bioplastics are being used raw materials derived from plant and animal world, often trying to use those materials that otherwise would be bound to be discarded or destined for composting. The process of production of bioplastics is such as to produce molecules that are still close enough to the natural molecules known to be attacked and digested by the bacteria, and then retransformed into simple elements from reentering the environment. Today, there are regulations that define and regulate the production and marketing of these new substances: EN 13432 for Europe, ASTM D6400 for the USA. Standing the standards on biodegradability, the materials that comply with them can be defined Bioplastics or biodegradable and compostable plastics. There are agencies designated to issue the certification of biodegradability. They are VINÇOTTE, DIN CERTCO for the Europe and BPI WORLD for the U.S. The materials that have been certified for compostability have the right to use the trademarks OK Compost and/or Compostable Logo shown below. The raw materials used are starches and sugars. Especially the corn starch, which is already available on the market in industrial quantities as a raw material for many other uses of the food industry, but also wheat or potato starch. In addition to plastics derived from starches, there is a large family of substances that go by the name of polyhydroxyalkanoates which we will discuss in the next paragraphs. The research, however, suggests continuously new materials and manufacturing processes that could prove economically viable in the near future. For example, at the University of Nottingham and Leicester they have shown that it is possible to produce bioplastics using eggshells as raw material extracting a protein call Glycosaminoglycan. Or another material that has come recently under the spotlight is a kind of foam with properties similar to Styrofoam (expanded polystyrene). In this case the starting materials are clay and milk. It’s still too early to say that this material can replace the foam as there are still technological hurdles to overcome, not least the fact that the material smells like sour milk. If these difficulties were overcome however, we will have a packaging material can be decomposed to a third of its initial mass in about 45 days. While the foam is almost eternal. The use of bioplastics is increasing day by day and experimentation produces interesting results. In Liguria (Italy) there was an experiment that saw the replacement of traditional polyethylene cloths for mulching with similar sheets produced in bioplastics. By using biodegradable fabrics you avoid having tons of plastic film to dispose of at the end of the crop. Throughout the Italian cultivation of lettuce are used 8820t of polyethylene sheets, for the cultivation of tomatoes, are used 23.580t. So every year we dispose a total of 32,400 tons of plastic to a volume of about 36,000 cubic meters, with the ensuing costs. The bioplastic fabric is thinner, 15μm instead of 40μm, and it is sufficient to be buried to become fertilizer for the next harvest. Replacing the polyethylene with bioplastics, from the point of view of energy, means switching from an equivalent consumption of 49.000t of diesel to about 20,880t, that is the energy savings would be equal to 28.120t, equal to 58%. If the same operation were to be done for tomato crops, the energy savings would be 75,000 tons of diesel fuel.